Aerotronics offers all the pilot supplies needed to make every flight of your general aviation or experimental aircraft an enjoyable experience. It is said that "the devil is in the details". Let Aerotronics provide the details to take the devil out of your cockpit. 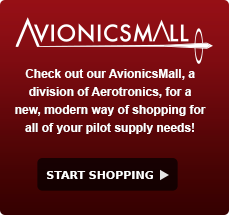 Contact us via phone or use our convenient on-line shopping experience at avionicsmall.com.